Hundreds of jobs could be lost at Cornwall's main hospital. The Royal Cornwall Hospital Trust (RCHT) has to make savings of £27m from its £290m budget for the coming financial year. 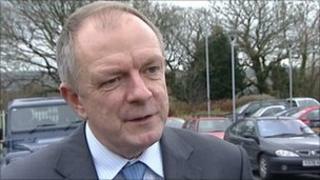 Chief executive Peter Colclough told BBC News "several hundred" posts would have to go. The trust, which employs about 5,000 people at the Truro hospital, said it hoped to avoid compulsory redundancies. As well as efficiency savings faced by hospital trusts throughout the NHS, the RCHT is also paying off a £34m loan to cover its long-term debts. The Royal College of Nursing (RCN) said it was worried the scale of the cuts could compromise patient care. Sue Matthews, RCN regional officer, said: "I think patient care is inevitably going to be affected. "I can't see how the organisation can make those sorts of cost-cutting exercises without losing services. "The trust has told us patients are already complaining and if they try to save this sort of money then quality of care will inevitably go down." However, Mr Colclough said he was confident the savings could be made without affecting patient care. Not admitting patients unnecessarily and ensuring they were discharged promptly when fit was one area where money could be saved, he said. "We think there's a lot of scope to be more efficient and productive in that area," Mr Colclough added.